Elder Kai Scholz: Luck 'O The Irish! I am in the Galway Ireland area and it is beautiful here. It is very cold and rainy and we bike everywhere, which is hard but it is fun. We are in a four man flat and we are having a good time. Elder Oxspring(AZ) and Elder Carmichael(England) are companions and they are the zone leaders. My companion is Elder Williams from Idaho. He is pretty quiet and a little shy when it comes to talking to people. All three of the other elders were in the MTC together so they are all pretty close already. We just went grocery shopping earlier and that was pretty fun and different. I have to exchange my british pounds of to Euros. So I am now on my third currency since I have been out. We spend most of our time GQing or Golden Questioning. Thats when we go to the downtown area which we call shop street, and just contact people. We talk to a lot of students, tourists, and drunk people. There are a couple big colleges around here so we meet a lot of foreigners (mostly brazilian) who are studying English. We went to church yesterday and it is in the top floor of a small office building. It was a big change from the normal ward. There was 28 people attending including the 6 missionaries. I was asked to introduce myself to the branch then give a 5 minute talk on the Book of Mormon. The branch president gave me this assignment right when we walked in the door. The other 2 missionaries are the Reimers. They are a senior companionship who will sometimes feed us and give us rides. I am emailing you in a small internet "cafe" with 4 computers and a lot of weird smells and drunk people. My companion told me to be nice to the owner or else he might raise the prices of the internet use. 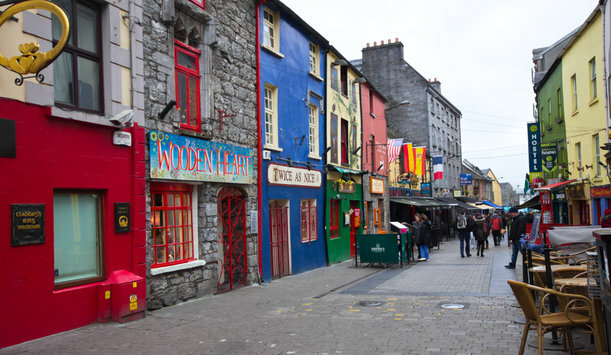 I will try sending pictures but you guys should google galway and look at images of shop street, the university, spanish arch, and the canal. These are the places we GQ. Thanks for your prayers and support! I'll keep you updated on my time here in beautiful Ireland.